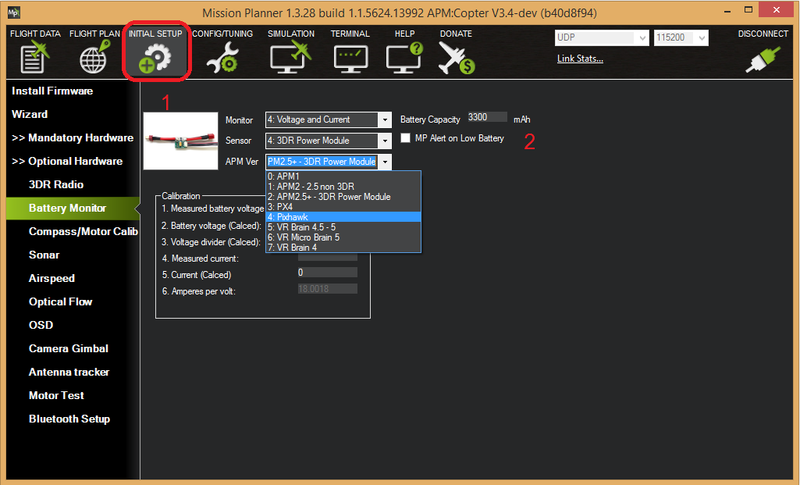 ArduPilot is compatible with a number of power modules. Battery measurement is primarily set up in the Mission Planner’s INITIAL SETUP | Optional Hardware | Battery Monitor screen. The Sensor selection list offers a number of Power Modules (including popular models from 3DR and AttoPilot) which you can select to automatically configure your module. If your PM is not on the list then you can select Other, and then perform a manual calibration as described below. The bottom section of the the Battery Monitor screen allows you to calibrate the voltage/current measurement in order to verify that the measured voltage of the battery is correct. You can also set the Sensor selection list to Other and use the calibration process to configure an “unknown” power module. 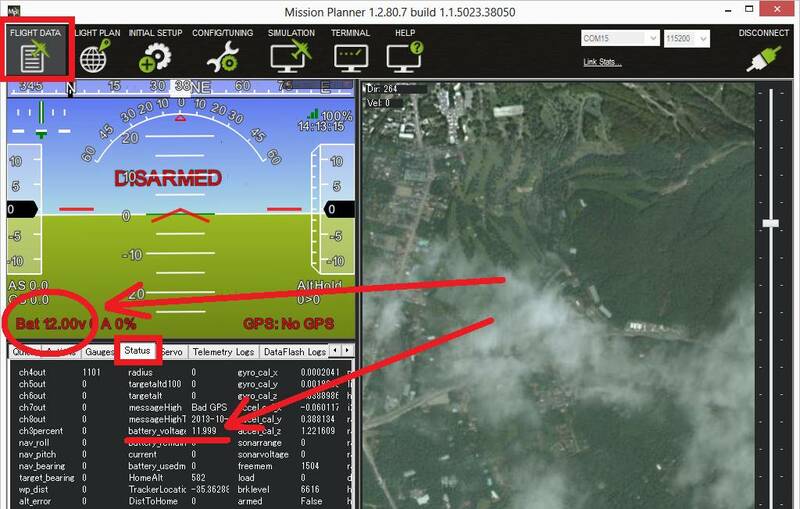 Check the voltage through the Mission Planner’s INITIAL SETUP | Optional Hardware | Battery Monitor screen or on the Flight Data screen’s HUD or Status tab. 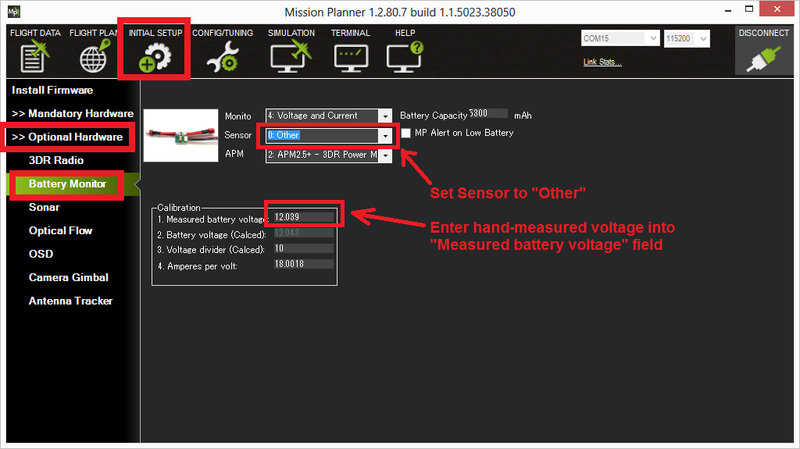 On Mission Planner’s INITIAL SETUP | Optional Hardware | Battery Monitor screen set the “Sensor” to “Other”. Using the power analyser you can also measure the current and compare to results displayed in the Mission Planner. Most current sensors are not very accurate at low currents (less than 3Amps). Typically you should perform current calibration at around 10A. The exception is PMs that use hall-effect sensors, like those from Mauch. This video shows the voltage and current calibration process using a Turnigy Power Analyser. You can set Mission Planner to alert you verbally when your battery is low (using a computerized voice). Simply check the MP Alert on Low Battery checkbox and enter the warning you wish to hear, the voltage level and finally the percentage of remaining current. The power module is generally plugged into the default port on the flight controller (ie. Pixhawk). If you wish to change where the power module is plugged into the controller, the pins used can be modified using the BATT_VOLT_PIN and BATT_CURR_PIN parameters. The list of available analog input pins that can be used are listed on the Hardware Options page for each board (Pixhawk, APM2).